Relief Help: Robertson or Miller? As the hot stove has begun heating up, and free agents are starting to land, I figured it was time to explore the situation going on with the New York Yankees’ bullpen. Should the Yankees re-sign David Robertson? Should they go seek other options, specifically the big lefty Andrew Miller? In this post, we’ll compare and contrast these two fellows and hopefully come to a decision. Let’s first talk about Robertson, because he’s probably the option we are all more emotionally attached to. Yankees fans have grown to love Robertson as we have watched him mature into one of the better late inning relievers in the game–first as the team’s 8th inning guy and last year, finally, as the first closer after the Mariano Rivera era. “Berts,” as my buddy Tom and I call him, was drafted by the Yankees out of the University of Alabama in the 17th round of the 2006 amateur draft, and made his debut with the club just two years later in 2008. After struggling a bit in his rookie season, he quickly aclimated to the major leagues and eventually became the rock Joe Girardi could lean on in a late-inning pinch. In 402 appearances in his career, he has put up a 2.81 ERA, a 1.215 WHIP (hasn’t been above 1.170 since 2011) and 12 Ks/9. Robertson features mostly a mid-90s cutter and a Buggs Bunny type curve ball. He’s been awesome, and we love him. Miller, on the other hand, doesn’t have quite the track record, or career stability, that Robertson boasts. Like Robertson, Miller was drafted in 2006, but as the sixth overall pick to the Tigers out of the University of North Carolina. He made his MLB debut later that summer, but eventually fell out of favor with the Tigers and was traded to the Marlins in the Miguel Cabrera deal. The Marlins eventually traded him to the Red Sox three years later. Also unlike Robertson, Miller has only been really good for few years, and an “elite” reliever for one season. That being said, he was pretty damn awesome last year, combining with the Sox and Orioles to put up a 2.02 ERA, a 0.802 WHIP and an astounding 14.9 Ks/9. Miller throws gas, regularly hitting 97 with his heater, and putting away chumps with a nasty, nasty slider. Like many things in baseball, this one will probably come down to money and years. Robertson wants five guaranteed years at top closer money (I refuse to call it “Papelbon money”). That’s probably going to amount to about a $50M commitment for whatever team signs him. Miller, meanwhile, is looking for four years, and probably won’t make more than $10M per season because he has never closed before. Both guys are the same age and have injury histories that don’t include any arm troubles what so ever. Both are very familiar with the AL East too, which is a bonus. Miller throws a little harder, but Robertson’s Curve Ball might be the better strikeout pitch. Other than almost a foot of height difference (sorry, Berts), and the fact that they throw with opposite arms, these guys are fairly similar. I always feel a little silly talking about financial restrictions when it comes to the Yankees, but it seems that that’s what this choice will come down to. I think they much prefer to keep Robertson because he’s a proven commodity, but they don’t want to shell out all that money over five years. Some speculate that their interest in Miller is a ploy to pressure Robertson to sign on more favorable terms for the team, but I could definitely see them walking away from their home grown righty and going with the big lefty for less money and years. Look. 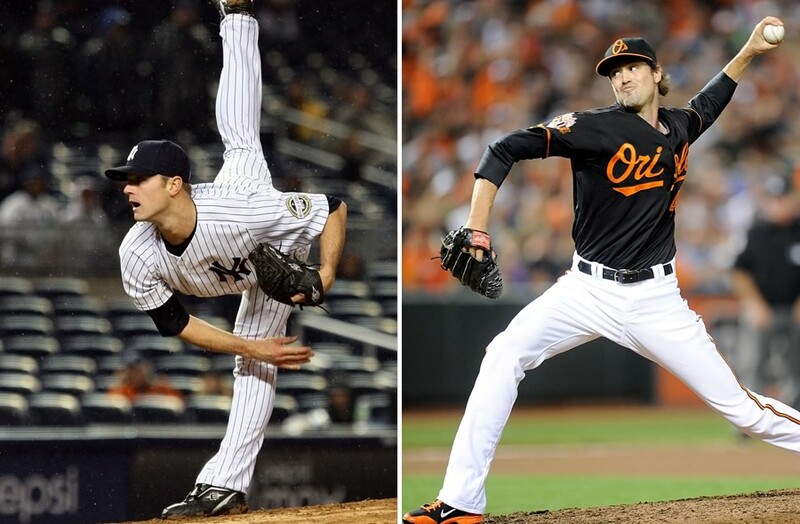 I think the bullpen will be very solid no matter which guy the Yanks end up with. The real star of the show is going to be Dellin Betances, who can pitch two innings a night. Guys like Adam Warren, David Phelps and Shawn Kelley should help bridge the gap between the starter and Betances and whoever the closer ends up being. Ideally, I’d love the Yankees to remember that they’re the Yankees, go to the money bin, sign both of these guys and have the best bullpen in baseball. Realistically, however, I think the ninth inning is going to end up being Miller time in the Bronx. Maybe we’ll all be living the High Life together… see what I did there?